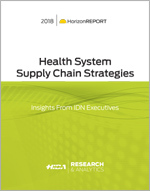 HIDA Horizon Report, Health System Supply Chain Strategies, takes an in-depth look at how supply chain models are evolving. Gain insight on how healthcare distribution is poised for growth. HIDA’s latest survey of more than 1,000 patients reveals televisits are enhancing physician-patient relationships. Patients are very enthusiastic about their experiences with televisits, citing speed, convenience, and clinical quality as the factors that drive their high levels of satisfaction. HIDA’s latest Horizon Report details how patients are taking ownership of their healthcare. Learn directly from patients what actions they are taking to derive the maximum level of care for the minimum level of expense. Informed by HIDA primary research in a survey of 1,000 patients, Millennials As Healthcare Consumers offers detailed information manufacturers and distributors can share with providers on the high expectations these younger consumers have for healthcare providers. Use these findings to help your customers achieve success with the largest generation in America. Published: 2016. HIDA’s Research & Analytics team has found patient satisfaction is a high priority for providers across the care continuum, with nearly all providers making it a key strategic focus over the next two years. In a survey of 1,000 patients conducted by HIDA, nearly half of patients report experiencing dissatisfaction with a provider over the past year, presenting a timely opportunity to engage with your customers on how your products can help them improve patient satisfaction. Use these findings to position your products as solutions that ensure patients' perception of high-quality, patient-centered care. Seasonality of Demand: Insurance Trends, Consumer Behavior Impact Healthcare Utilization is the third book in our Horizon Report series. Each quarterly report takes an in-depth look at a specific new or growing sub-market, product line, or trend that may affect multiple markets. The report examines the seasonal shifts in patient volume. We look at provider activity and volume in all markets over a six-month period. HIDA’s Horizon Reports are designed to give members a quarterly in-depth look at a specific sub-market, product line or trend which crosses multiple classes of trade. The Q4 2015 title, Primary Care Evolution, Care Settings Shift to Meet Consumer Demands, takes a look at new and evolving patient care models driven by increasing consumerism in healthcare. Included segments profiled are retail clinics, urgent care, telehealth, point-of-care testing, on-demand lab services, and changes in emergency rooms and 911 response. Checkout button appears when you've added items to your cart. Note: If placing an order for a quantity of 26 or more, please contact our office to place the order. 703-549-4432 or support@hida.org. All sales of HIDA publications and products are final – no returns, refunds or exchange.